Hey Sleepless Moms, it can often feel like there’s just not enough time in the day to take care of all your endless mom duties, let alone take care of yourself. From preparing meals, snacks, driving to and from school, activities, playdates, doctor’s visits, and everything in between, where do we find the time to do something for ourselves? If you’re anything like me, juggling a baby and toddler, it’s hard to just take a quick shower sometimes or even brush your teeth! Well, if there’s anything I always make time for, it’s my skincare routine, especially living in sunny Southern California, sunscreen is a huge must every day. I’m happy to have found products that not only work, but that I can easily incorporate into my busy mom life. 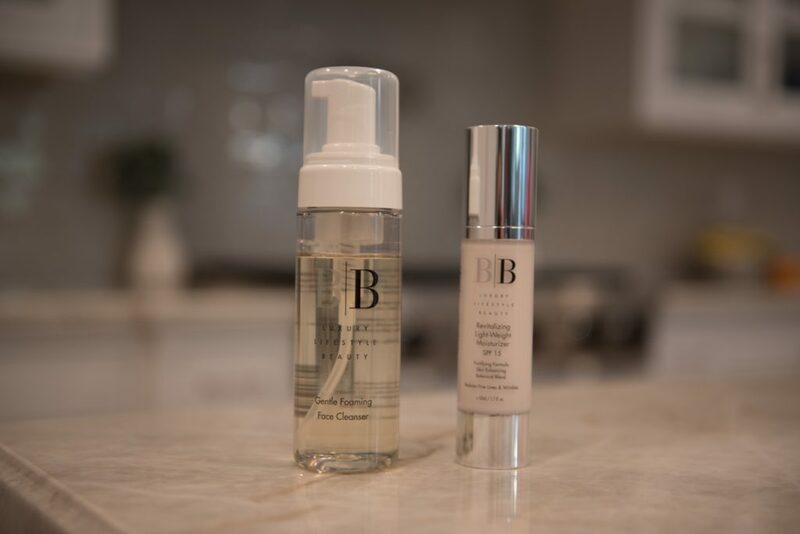 B|B Lifestyle skin care products are organic, vegan, free of gluten, parabens, fragrances, and artificial colors whenever possible. These are things I never used to think about prior to being a mom. Now that I have little ones, I’m much more conscience about the products not only my family uses, but that I use for myself as well. B|B Lifestyle products are also gentle, which is perfect for all skin types, especially sensitive skin, which is what I need. I also love the antioxidants they use in their products, which helps skin recover from signs of aging and damage from the past- yes please! They even have skin brighteners and hydrators so you can achieve that glowy look, even if you’ve only had 3 hours of sleep. I’m pretty much all in for any product that’s not only good for my skin, but makes my skin look and feel as young as possible. My skincare routine in the morning is as easy as washing my face with the Gentle Foaming Face Cleanser, applying the Revitalizing Lightweight moisturizer, and applying the Ultra Lux Moisturizing Sunscreen, especially for those sunny California days! B|B Lifestyle skin care products are also innovative. You may have heard about CBD skin care products breaking through into the health and wellness market, such as CBD face wash CBD facial moisturizer, various CBD SPF products, and CBD sunscreen. With the healing benefits of CBD products in mind, B|B Lifestyle has set a new benchmark with their proprietary HC56Complex™, an over-achieving hemp oil, that’s infused into every product, leaving your skin looking and feeling radiant all day. To find out more about B|B Lifestyle, check out their website below and use code “jessica” for 20% off your order until November 15th, 2018!